Some musicians have their feet firmly under entertainment's top table. Streisand and McCartney are two who don't even need first names to make their introductions, Bocelli is another. 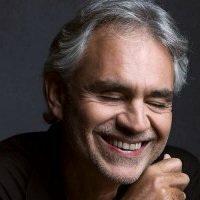 Seeing Andrea Bocelli perform is, for many music lovers, a once in a lifetime opportunity. Born in Pisa in the late fifties, the Tuscan didn't make his breakthrough until he was in his mid-thirties, winning a newcomers award at Italy's Sanremo Music Festival. He's made up for the late start however, shifting more than 70 million records worldwide in the decade-and-a-half since. He has won a Golden Globe, been the only classical artists to be nominated in the main Best new Artist category at the Grammys and has topped the US classical charts on eight separate occasions - a record. He has an entry in the Guinness Book of World Records for his chart feats and his voice possesses that rare ability to make women everywhere clutch their hands to their bosom, close their eyes and rue the romantic shortcomings of their husbands. He's the biggest selling solo artist in the history of classical music, has a star on the Hollywood Walk of Fame and has even survived a duet with Celine Dion. The tenor is widely regarded as the world's greatest living classical vocalist, certainly the most popular, and he is coming to the UK and Ireland late next year. The UK/ Ireland tour begins at the The O2 in Dublin on 6th November, followed by dates at the Odyssey Arena in Belfast, the LG Arena in Birmingham and Liverpool's Echo Arena, before the final show at The O2 in London on 14th November 2012. We will have tickets for all gigs when they go on sale at 9AM on Friday 2nd December, priced from £45 to £120 for the very best seats (price TBC for Dublin).